​were always meant to be. Imagine waking up each morning feeling in the flow, aligned and FREE of the doubt, fear or worry that pulls you away from life. A mind that feels clear (finally!) and drama free. Your energy is balanced a HELLA better than it used to be and you actually have the TIME + ENERGY to do the things that really light you up. This sleeping giant within of brilliant sparkle and purpose has been woken up. This new you feels like, well, YOU. The REAL YOU, not the one that's been hanging around just waiting on the sidelines. This sense of peace, clarity and confidence begins to unfold and, baaaaabes, it's like a light turned on. I can’t tell you how many times I’ve had the conversation with other women who know what they want in life, but the day-to-day drama in the mind (hello fear + doubt) or attaching to their pain story (that wants to be healed and released) seems to keep them ‘stuck’. It's that feeling of spinning your wheels and feeling like you are losing the traction you want. Some days you are on fire and ready to take on the world! It’s flowing, aligned and feels good. And then, sh*t, there’s a huge drop right into the valley… like the wind got knocked out of your sails. It doesn’t feel balanced like we want it to. Ugh. Life isn't supposed to feel like this. And some days that hurts. Deeply. We have this nagging voice reminding us that we are made for more, that we’ve been designed for a deeper experience in this lifetime. You did not come here to live a stressful and mediocre life, babes. Your brilliant spirit was NOT designed this way. You brought yourself here to rise above the drama in the mind, to learn deeeeep compassion for yourself and to be FULLY involved in life. You came here to manifest your greatest gifts and desires... In THIS lifetime. "I neeeeed the right (read: perfect) steps to take and then I'll start"
All lies, and the strong and resilient version of your knows this. We aren’t perfect. But we don't need to be perfect to manifest a different experience in life. We just need to be willing to change and show up for our life differently. Literally, millions of women are waking up and starting their journey. They are living their life without apology, no more saying ‘sorry’ for taking up space, loving their mess, healing the pains and taking the risks that bring us deeper into the purpose we KNOW we are meant to feel. This is your journey too. ​or take steps towards that online business that you are aching to start. 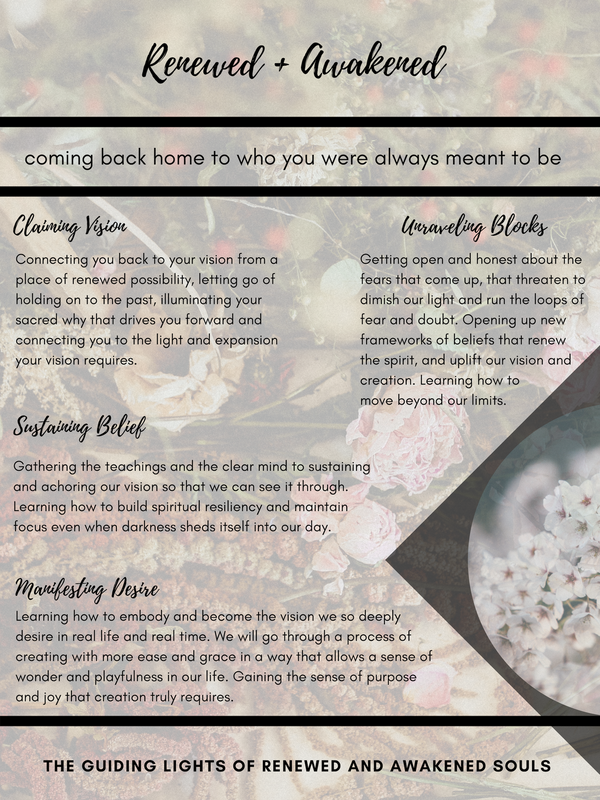 You have a desire and a passion for change, it's time to immerse yourself in truly activating that into real life and real time and to come back home to yourself again. 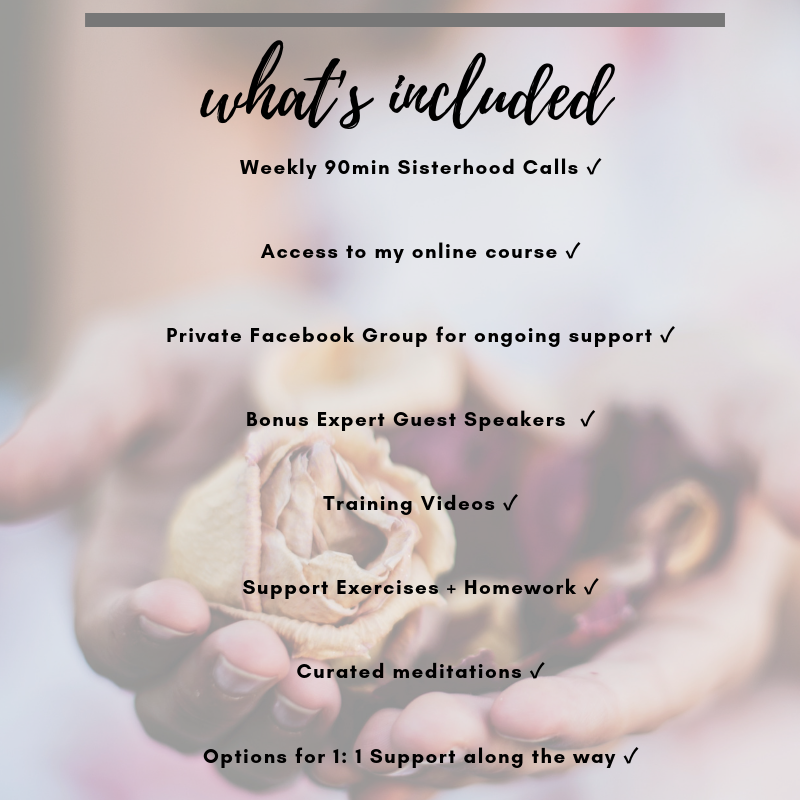 This course and sisterhood is here to help you do just that. 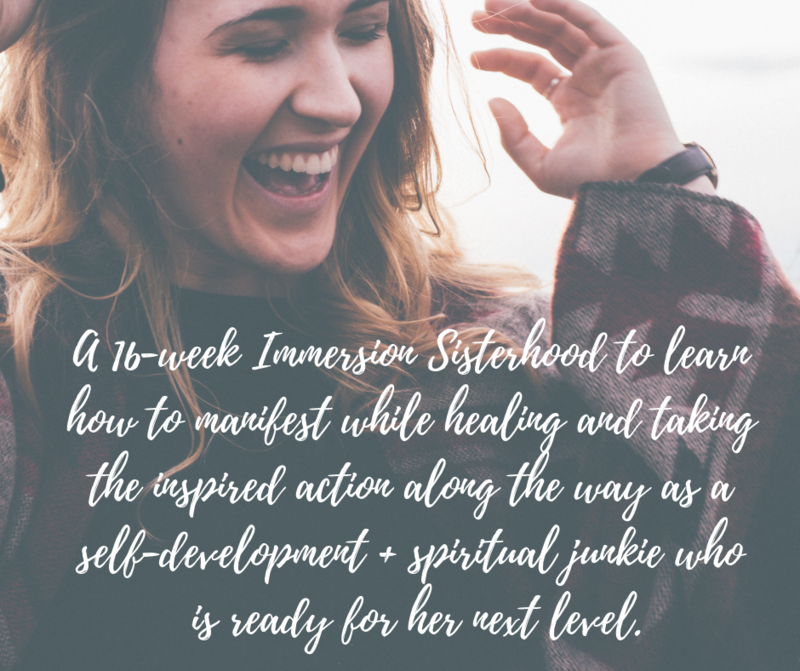 Join us for the next 16-Week Immersion Sisterhood and experience the magic for yourself. Because when you show up, do the work, share, listen and trust, your life changes. Yep, Agreed. Sign Me Up! You have come here with a divine right to be here, no less than the power of creation. You have a right to shine your light and let it be good. I'm in. show me the next step! We have a powerful source of intuitive knowledge within you to guide you along the way. We only second guess ourselves if we have let this recede or fall away. 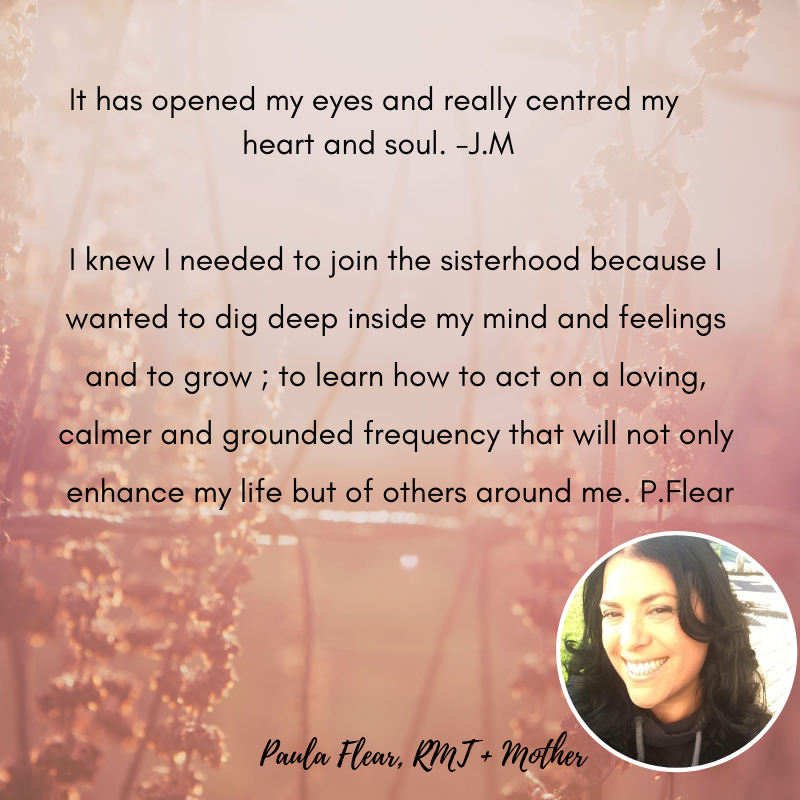 This sisterhood works to reconnect us back through this place of knowing. We understand our role is to give ourselves permission to have our desire first and the willingness to bring this into real life and in real time. Manifesting is an active practise housed in the clarity available to us when we sink into our present body. We manifest with a deep willingness to let it be good. We do not seek perfection, but rather we take the action guided by our intuitive body. We don’t look to gurus for the answers, but rather their guidance to come back home to what we already know. We are never stuck, only attached to an idea that retracts our energy, so we invite new questions in. Fear, Doubt, Worry and Anxious thoughts are an emotional experience that we no longer judge nor attach ourselves to. They are not anchoring our beliefs. We accept them and love them because we are human and learn along the way. We thank them for showing up and learn from them. They teach us what still wants to be healed. ​If you are feeling deeply called into change, ready to open your gifts in to this world and finding that sense of calm, confidence and clarity to make this possible, this is for you. Nah, I know this is my next step! I'm in, baby! ALL calls/trainings are recorded, so no worries if you miss a call or two. This will not impact you getting what you need from the course/sisterhood. There will be regular Office Hours for you to chat directly with me and ask any questions, get feedback on something or anything else you need. Calls are from 7:30-9PM EST. The day for the calls is set for Tuesday, but will be adjusted if required to meet the needs of the group.